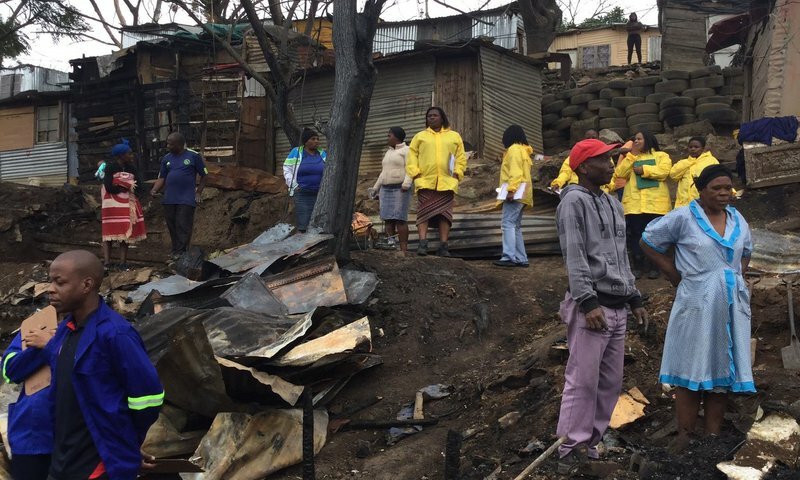 eThekwini's Disaster Management officials say Kennedy Road Informal Settlement residents who lost their homes to last night's fire are now being housed in a community hall temporarily. More 200 homes were destroyed by the blaze, leaving some residents with the just the clothes on their backs. 49-year-old Raymond Ngobe who has lived in the settlement since 2006 says he is left with only his I.D book. Ngobe says he fire started at around 6pm and spread quickly. "I was coming from town, after 18:00pm and I found my house burning. I am only left with my ID that was in my pocket and the clothes I am wearing. I haven't eaten since yesterday, I lost everything," he said. He says it is the second fire that has burnt his house down at the settlement. Relief organisations, Al Imdaad and Gift of the Needy have also come to the residents' aid. Gift of the Needy's , Faiaz Majid says they have been getting food and blankets to the affected people. "It was a sad sight seeing people left homeless. We have come here to see how we can help, It is very sad, about 250 families and small children are without homes," he said. The Shoprite Soup Kitchen is also helping feed the residents.